Sacroiliac injury is a major source of pain in the pelvic/sacral region. Injury can affect the soft tissues or skeletal components of the sacroiliac, potentially leading to chronic pain in some instances. However, when it comes to injury, there are many basic facts that need to be remembered by doctors and patients alike, such as the body’s natural primary imperative to heal. Therefore, some cases of chronic pain based on past insignificant injury seem quite illogical from a scientific viewpoint. Injury can affect any part of the anatomy. However, it is also important to recall that the SI joint is one of the strongest in the body. It has been proven that stress inflicted on the SI region will usually break the pelvis before it damages the joint itself. Additionally, the ligaments that bind the SI together are also some of the strongest and most durable in the body, although both the ligaments and joint itself can face trauma that may create injury given particular circumstances. This treatise examines the idea of injury being responsible for many cases of sacroiliac pain. We will explore the types of injury that can occur to the joint, as well as why the idea of trauma as a primary causation of SI symptoms is often a bit unenlightened. Injury can occur to any or all of the tissues that compose the SI joint and/or its surrounding anatomy. There are many ligaments that bind the SI together and over 30 muscles which attach around the joint. Injury can certainly affect any of these components, as well as the skeletal structure of the joint itself. Injury can create fracture of the bones or deep bruising to the skeletal tissues. Injury can affect the ligaments, potentially causing them to suffer tears or even detachments in very rare circumstances. Muscular injury is the most common around the sacroiliac joint, with strains, sprains and detachments all possible. Sometimes the entire joint might be traumatized by a focused form of damage, while in most instances, a specific tissue of the SI will fall victim to damage while the remainder of the joint remains unaffected. Car accidents, significant falls, acts of violence and sporting injuries are all the most common traumas that can befall the sacroiliac region. All of these circumstances can generate tremendous force and traumatize the entire joint or any component of the joint. Penetrating injuries, such as gunshots or impalements, are the most likely to damage the skeletal structures of the sacroiliac. Childbirth is often called injurious to the sacroiliac, but this is misleading. The facts show that the SI responds to relaxin and other hormones that are active during pregnancy and childbirth, but that the effects on most women are temporary and constructive to prevent damage during birth, rather than initiate it. Arthritis and other disease processes are also often said to injure the sacroiliac joint, but their damage is better described as deterioration, rather than trauma, so we deal with this topic in our study on sacroiliac degeneration. As noted in the opening section, the SI joint is super durable. It takes really concentrated stress to damage it in any way. This fact is scientifically verified and indisputable. However, we see many circumstances where minor traumas to the body as suspected of being the causative mechanism for horrific chronic sacroiliac pain syndromes. This is usually illogical. 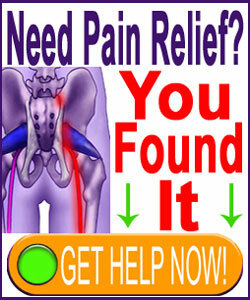 This is not to say that the sacroiliac is not damaged or painful, since in some cases, it is. However, in these circumstances, the “injury” might be incidental to other processes that are the true cause of pain, such as sacroiliitis, ligamentous dysfunction or degeneration. Even if the joint is traumatized, the body should be able to repair the damage in virtually all cases. Lasting trauma at such a strong and anatomically important location seems to defy the body’s major programmed responses. Perceived injury is a leading cause of nocebo effect and can be the perfect opportunity for mindbody pain syndrome to begin. Dr. John E. Sarno writes much about how small traumas are mistakenly blamed for creating major spinal issues and these circumstances also apply perfectly to the SI joint. For more information on how minor injury can perfectly disguise psychosomatic pain syndromes, please search the word “trigger” on the sites of The Cure Back Pain Network.